How Fast Is Bernard Lagat? HAYWARD — Alitta Boyd had a scholarship offer from a college in every state except Alaska, but in the end she decided there was no place like home. The Moreau Catholic High track and field standout orally committed to USC and will sign a full scholarship to the Pac-10 school on Wednesday. "It's in California," said Boyd, who placed second in the triple jump and third in the long jump at the California Interscholastic Federation state championships last year. "It's my home state. It's where I have lived all my life." The 5-foot-11 Boyd said she narrowed her choices down to Texas A&M, LSU and USC before making her final decision. "It was tough," she said. "It wasn't easy. I had all my family and friends tell me what they thought." Boyd had been a three-sport star at Moreau from her freshman through her junior season. The senior, though, decided to drop volleyball this year to concentrate on track and field and basketball. She will compete only in track and field for the Trojans. Contact Michael Bower at mbower@bayareanewsgroup.com. The Bay Area Frosh-Soph Championships will be held on May 2nd at Castlemont High School (Oakland). This is a chance for ALL your younger student-athletes to get a chance to win races, win medals, and finish their season off with a culminating, championship event that celebrates their hard work. This will be a smooth, well-run meet with lots of volunteers, FAT timing, announcing, and music. For most of these freshmen and sophomores, this will be their state championship meet, and we will run the meet as such. Winners of all events will win champion t-shirts, Saucony spike bags, and a gold medal. The top six of all events will medal. The competition will be excellent! Currently, committed teams include Castro Valley, Lowell, San Rafael, Hayward, Bishop O'Dowd, Fremont, Oakland Tech, Oakland, McClymonds, San Ramon Valley and Castlemont. The Castlemont Complex is great for both spectating and competing. Newly built in 2003, it has all-weather runways and an all-weather eight-lane track with a large grandstand on the homestretch. We have about 10 spots remaining for the Twilight Relays. We are very PLEASED and HONORED to announce that Shannon Rowbury will be on hand as our special AWARDS PRESENTER this year!!!! She will be on site to meet and greet and sign some autographs as well! Don't miss this special opportunity!!! Full meet information at [ http://www.twilightrelays.com ]www.twilightrelays.com . Please let me know if you plan to attend -- this year is shaping up to be an incredible meet! If you haven't done so already, CCS is running one more of these clinics next Tuesday, February 3rd at North Salinas High School (55 Kip Drive, Salinas Room 801) from 6:30-8:00pm. It's great information for all coaches as we head to the start of the 2009 Track and Field season. I think you will all be surprised how well you truly know the rules of track and field. This past Thursday, Jack Daniels was the guest speaker at the Sports Basement, Crissy Field for the Focus N Fly 2.0 Launch event. It was a great turnout of runners and coaches who were entertained by the Daniels' talk. Interestingly enough, he is a local guy who went to Sequoia HS in Redwood City. He is a two time medalist in the Modern Pentathlon (silver and bronze) in the now discontinued team event. Here are some bullet points from his presentation. What did my coach do to me? He then showed a weekly schedule for Jim Ryan in HS. I am sure some of you have seen what he did (HOLY!) but I could not write it down fast enough. I will post it when I find it or if someone has a copy, please send. He also added what Gerry Lindren used to do (HOLY ####!!). It included a LOT of mileage. He mentioned asking Gerry what was his longest run that he ever did. 66 miles! What was the most miles he did in one week? 360 miles (50 miles A DAY!). Despite all those miles, Gerry suffered one injury in his running career and that was when he was hit by a car while running. That makes perfect sense to me since he was on the road so much, you figure that his chances of getting hit were a little greater than the average runner. A quote from him "Get the maximum benefits from the least amount of work". If you have any specific questions about any of the above bullet points, let me know. Who are the stars for this coming season? Toughest event to qualify for the state meet? Most of you are familiar with Dana Carvey, one of the most famous ex. Saturday Night Live performers. But what many of you don't know is that Dana is also a former local high school runner who ran in high school at Carlmont HS along with his older brother Scott for the legendary coach, Loren Lansberry. Here is a result link for both of them when they ran in high school. Scott ran in the Varsity race finishing 4th while younger brother Dana won the Sophomore race. Trivia Question: What other famous comedian ran the 800m. at Redwood HS? Attached is an informational flyer a Track & Field clinic being sponsored by the CCS Track & Field Championships Games Committee. Purpose: Provide informative information, rules interpretations, meet procedures and to have open dialog and sharing among coaches. How much does it cost: NOTHING! This Clinic is FREE. It is our desire to provide this free of charge opportunity on three different nights in three different locations in our section to encourage our coaches to meet, share, and learn. When & Where: Choose the evening that is best for you! This clinic is FREE! NOTE: Due to construction, please South Drive entrance and use stadium lot ONLY. • That exit becomes Grant Road. coming in either direction: take either Highway 101 or 280 towards San Mateo. • If you are taking Highway 101, take Highway 92 West to the Alameda de las Pulgas exit. • Turn left on 20th Avenue. Serra is on the right, about one and a half blocks down. • If you are taking Highway 280, take Highway 92 East to the Alameda de las Pulgas exit. Check out what they claim this kid could run for the mile. They even got his VO2 Max. Courtesy of Keith Conning's blog. The following link will take you to top returners in all track and field events in the San Joaquin Section (SJS). Who are the new stars in the SJS now that German Fernandez is getting ready for track season in Oklahoma St. and Laurynne Chetelat at the Farm? If you are planning on attending, please RSVP as they would really like to get an idea of how many people to expect. Last year was the first year I took my kids to this meet and they are still talking about it. Highly recommended meet that your kids will love. It's just a perfect early season meet. To contact the meet director (Jason Jacobson), see his contact information below. This will be held on Saturday, March 14, 2009 @ San Rafael HS. we often draw a similar slate of schools. beginner to elite heats, under the lights! The following is a link to Keith Conning's blog where he lists the fastest NCS returners from last season in all events (boys and girls). If there are any omissions or errors, please contact Mr. Conning at his email address (conning@aol.com). Remember that the top 4 athletes and/or relay teams will qualify to the state meet UNLESS...other runners/jumpers/hurdlers/throwers/relay teams surpass the At Large Marks which are also linked below. possibilities for a successful future for our children, expenses become a primary concern. Yes, running can help cut the cost of college, perhaps even dramatically. NCAA Division I and Divsion II colleges can offer athletic scholarships. NCAA Division III colleges cannot offer athletic money, but there are many academic scholarships that coaches have access to. NAIA schools (usually smaller academies and religious colleges) have no restrictions on the amount or the number of scholarships, and many have very large endowment funds to draw from. Junior Colleges, esecially those outside of California, often offer money to athletes. always get to all the athletes. The very top athletes get lots of attention but the athletes near the top need to promote themselves to the colleges. Coaches really appreciate having information come to them in their e-mail in-box, since that is one less search they need to make. Recruiting is a big part of the college coaches’ job, and your input helps them out. This is a very good question. You need to look at it from the coaches’ viewpoint. They have to know how to contact you, and they need to know your academic achievements as well. Grades do count when it comes to recruiting. Then you need to list your academic goals. Finally, you get to put down your athletic accomplishments. You will also need a coaches’ assessment statement, and contact info for the coach (that’s me). Including a picture of you in competition helps too. If you are interested in reading the rest of this article, please email me at albertjcaruana@gmail.com and I will send you the entire article in pdf format. Sorry for the hassle but I am not able to upload pdf files on this blog. Today we chat with Tamalpais HS sophomore, Daniel Milechman. For a young runner with only two years of cross country experience, Milechman has already established himself as one of the top runners in Northern California by his performances in the North Coast Section Meet of Champions and at the cross country state meet. His times and places resulted with Milechman claiming the sophomore runner of the year honors on the 2008 All NorCal Cross Country team. This spring, Milechman will put the golf bag aside and give Track and Field a try in the ultra competitive NCS distance races. 1) How did you discover and get started with the sport of Cross Country? My brother Sam was a cross-country runner in high school and enjoyed the experience. He had great success as a runner and loved the social as well as competitive aspects of the team. Watching his races and seeing how much fun he had drove me to do cross-country, despite my interest in playing for the High School Soccer team. I'm not just a runner. I like to play soccer, basketball, tennis and golf. On weekends, I'm almost always playing one of these sports. In the past, I have played on basketball, soccer, and baseball teams and enjoyed them a great deal before turning my main focus to running. 3) As you were first starting out in the sport, who were the runners that were role models for you (on your team or other teams)? My brother Sam was a great motivation to me, as he got me interested in cross-country. But really, my teammates have provided unbelievable motivation. I came in as a freshman on a boys team that was mostly made up of Juniors, with a few Seniors. Cory Rand, Kalen Rago, Michael Fearon, Chris Lowell, Cody Chapman, and Sam Brigham are just a few of the many runners who have made my experience so much fun. They have an unbelievable attitude that makes the practices so much more relaxing and enjoyable. I can't say enough about all of my teammates. 4) You had a very successful 9th grade season in cross country. What would you say was your best race as a freshman? As a freshman, I worked hard all season and peaked at the end of the year. I had a strong MCAL league race, but I felt that my NCS performance was by far my best race. I ran my best time in 16:20 and felt that I pushed myself harder than I ever had the entire season. 5) In terms of cross country: favorite race? favorite course? favorite competitor? favorite workout? favorite run? As far as my favorite race goes, I would have to say that it is the state meet. I ran it for the first time this year, and the excitement and hype that surrounds that race is unbelievable. For me, I love the competition, as it pushes me to another level. My favorite course has to be the Tam home course. I have run it so many times that I know exactly how to maneuver it and feel confident every time that I run there. I wouldn't say that I have a favorite competitor or workout, it just depends on the day. 6) What did you do this summer in preparation for the season that was different than your previous summer? This summer, I definitely set myself up for a strong season by running hard. 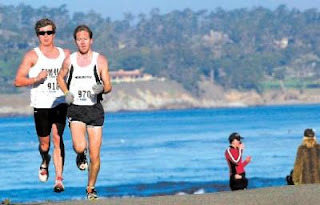 For the most part, I ran with former Tam runner Nick LaPlant, who is now a college runner and pushed me all summer long. The miles I put in were not astronomical; probably only 15-20 per week. But I ran hard for every one of them and got myself into good shape for the beginning of the season. 7) What was your proudest accomplishment from this past season? My proudest moment was coming in first place at NCS, though it is followed closely by my third place finish at state. The main difference between the two was that our team won at NCS, which made the whole experience infinitely better. Our team won by a single point, and that made me realize that had I finished second, which would have been a great accomplishment by itself, we would not have won. The same is true for all my teammates- one more place back and we would not have prevailed. Tthe knowledge that we had all worked together and that each of us had carried his load made me and the team amazingly proud. 8) Your team competes in the MCAL. Tell us a little about the competition in that league and how it helped prepare you for NCS and state. In the MCAL competition, I had wonderful competitors in Erik Olson and Steven Iglehart. Even though I had never come close to beating Erik in a single race, I began the race by staying on his tail and seeing if I could keep up with his fast pace. Through the mile mark, he was in at 4:34 and I was right behind him at 4:37. He ended up winning the race by opening up a larger gap during the next two miles. Even though I fell off of him during that race, the fast start prepared me well for the state race. So, when my first mile at State was 4:41, I felt comfortable and confident. Steven ended up running a great race and passing me for second place, and his competition drove me during the final mile as well. 9) Tell us a little about your NCS race against St. Mary's Dan Maxwell. My NCS race against Dan Maxwell was amazing in that everything worked exactly as I had hoped it would. I had never run against him before, but I knew that he would be gunning for the lead and that he would put up some tough competition. He lead the race for the first mile and a half or so, taking out a quick pace that left the rest of the field far behind. I hung right on his back as we cruised to a 4:45 mile and continued to stay with him from there. With strategic aid from my college running mate Nick LaPlant, I broke away from Maxwell with a short spurt of energy just before the two mile mark. This was the plan; sprint on that downhill straightaway to create separation. From there, I continued to break away. Dan Maxwell ran an excellent race and an even better one at state, where we again were neck and neck for most of the race. 10) This was your first state meet experience. Tell us about some of highlights during the two days you were in Fresno. I had a great time in Fresno with all of teammates and coaches and family. It was the teams' goal to make it to Fresno, and we couldn't have been happier to be there. The highpoint was the race itself. I ran the best race of my life to this point, contesting for the lead during the first mile and hanging on during an competitive last mile for third place. 11) You did golf last year during the spring. Have you decided what you want to do yet during the spring and if you did, what helped contribute to making that decision? This year I have decided to do Track instead of golf. One of the main things that drove me to do Track was all of the great friends that I have made on the Cross-Country team that are doing track. This is the last season of competetion for the seniors, and I can't wait to spend all of my afternoons with them. 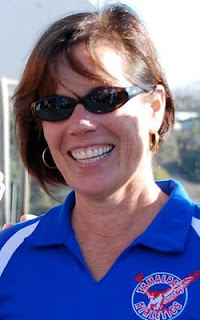 Today we chat with Tamalpais coach Sylvia Goodman who just finished her 8th season at Tamalpais High School. Her boy's team won an incredibly competitive NCS Division IV team race this past season by a single point over 2 time defending champions, St. Mary's Berkeley (and by five points over 3rd place San Rafael). Sylvia's top runner, sophomore Daniel Milechman, was just voted as the sophomore of the year on the 2008 All NorCal XC Team after winning his first individual section title and finishing 3rd at the state meet (An interview with him will be posted shortly). Sylvia also had a great deal of success during her own high school career (in a different state) which you can read about below. 1) How did you get involved with running in your childhood? I have 2 older brothers, and I used to joke that I took up running and tree climbing as a form of self-defense. Actually, our parents used to take us up in the mountains hiking a lot, and they would give us a 20 minute head start down the logging road ( I think the idea was to tire us out) before they started driving back. We'd run as far as we could before they caught up with us. I remember doing this when I was around 5, so I've been running for nearly 50 years. 2) Tell us a little about your running in high school and beyond and some of your achievements? In high school in the late 60's and early 70's I was 3 time Oregon state champion in the 880. Unfortunately, injuries pretty much ended my running career when I entered college. I am still in touch with my high school coach, Sharon Hatfield, and consider her to be my savior during high school and my inspiration and mentor. Coaching at Tam has given me the opportunity to complete the circle. 3) How did you get started with coaching? I am a psychotherapist by profession and early in my training I worked with a first grade boy who I had a strong connection with. He was a gifted runner, and I went to his meets throughout his grade school and middle school career. At his 1st high school race, I was introduced to one of the coaches who had heard of my back ground in running, and I was asked to coach cross country the next season. That was 8 years ago. At that time, the program was small, had not had consistent coaching, and not much success in recent years. 4) Who do you consider as your coaching mentors? 5) Besides your current coaching situation at Tamalpais HS, where else have you coached? Prior to coaching at Tam, I had coached boys rec league soccer, and middle school cross country and soccer. I sought out my high school coach, went to training seminars, and did my best to get up to speed on the most current training techniques before launching into the cross country season at Tam that fall 8 years ago. I also had great support from my assistant coach Bob Friedlander. The program has definitely been a collaborative effort. 6) Tell us a little about the Tamalpais program when you first started coaching at the school? 7) Can you identify a runner(s) that you feel helped elevate the Tamalpais program to what you hoped the program would become? We have had more strong teams than individuals, but Emilie Olson (07) went to state all 4 years of high school...as a freshman she was a member of the Tam girls team that placed 10th at state in D4. She competed as an individual the subsequent 3 years, finishing 18th her senior year. Sophomore Dan Milechman, who placed 3rd in this year's state D4 competition, is by far the most talented runner I've coached. Coming into the season, I knew I had a very solid core of 5 senior boys, and Dan had run well as a freshman last year, earning the #2 spot on the team after steady improvement. Dan is as solid emotionally as he is as a competitor, and his team mates love him. He does not particularly enjoy the attention his success has garnered, and is all about the team. When interviewed by the local paper about his feelings about going to state, he remarked that he was excited that his team would be there with him. 8) Your league (and area) did extremely well at the NCS meet this year. How did this helped your team? I think its great that we're in such a competitive league...it forces us to think strategically and constantly push. Nearly every school in MCALs had either a very competitive team or a top runner this year. It was great! It set us up well for NCS. Both the girls and boys teams did an outstanding job of coming together and really competing at NCS this year. I couldn't have been prouder. 9) What were your goals going into the season for your team and was it a surprise winning NCS? Coming into the season I thought the boys team had a decent chance to make it to state, and that was the focus of the season. My girls came so close to making it too...that was sweet! But the boys winning NCS and upsetting St Mary's by a point was huge! 10) In looking at what you do with your team, what do you consider as the keys to your team's success? Cross country is a physically and psychologically challenging sport. We try to make it fun, to foster a sense of family and a positive environment. As a result, I have athletes who more internally motivated. They learn the importance of working as a unit and not as individuals, with strong team values and respect for each other and other teams. 11) If you were to give advice to a young coach, what would it be? My advice to a young coach would be this: never lose your passion, your sense of humor, your patience, sight of your goals, or yourself. Respect each runner as an individual, support their effort, and listen. Make it fun. Thank you very much Sylvia! AJC. The following data is courtesy of www.episports.com. Norcal Teams are in bold. You want to know who are the fastest returners in all Track and Field events for Northern California? Look no further as I have the link for you. The following link and information is courtesy of Keith Conning and the Conning Tower blog. What is going to be the most strongest event for Northern CA? What will be the most competitive event in NCS? CCS? SJS? NS? Oak? SF? Who is the best athlete (in any event) in Northern CA? If you are 30 or older you will think this is hilarious. mailbox and it would take like a week to get there! usually talk over the beginning and @#*% it all up! like 'Space Invaders' and 'asteroids'. Your guy was a little square! levels or screens, it was just one screen forever! For cartoons, you spoiled little rat-bastards! Something up we had to use the stove.... Imagine that! For those of you that remember former Head Royce runner Clara Horowitz, here is a pretty cool story about her, husband and...well you will have to read the article. The son of Clara and Jeff Peterson finished the annual Rio Resolution Run well ahead of most of the competition Thursday, which was noteworthy because (1) he was in the first race of his life, and (2) officially, his life isn't scheduled to begin for another three months. Mama Clara, six months pregnant, was the first woman across the finish line at the 6.5-mile charity race, hosted by Carmel's Rio Grill, which made it a big day for the Peterson family. Daddy Jeff won the men's division for the second year in a row. And Baby — who doesn't yet have a name — seemed to enjoy the bumpy ride on a nice morning in Carmel.